When I suggested to go on an oyster excursion, my oyster-loving friends met the idea with both enthusiasm and curiosity. Through the years we had all become very experienced in ordering and eating oysters, but as we would soon find out, none of us ‘city-slickers’ knew exactly how they made it from the water to our plates, let alone what this process was called. Does one pick oysters, harvest them, dig them out? No one knew for sure, but it did not take us long to agree that we liked the thought of going hunting for oysters the most. 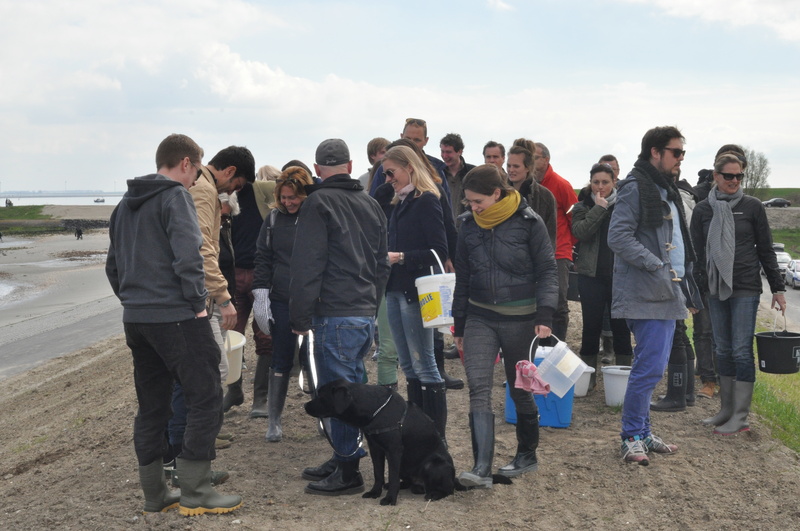 On a very early and sunny sunday morning in April, 14 people and a dog, left Amsterdam to go on our first-ever Oyster hunt! A good two hours later we arrived at cafe ‘Het loze vissertje’ in Wilhelminadorp, on a bay of the Oosterschelde (Zeeland). Here we were greeted by Marcel Schouwenaar who is the mastermind behind the Oestour and we were kindly offered a coffee and a Zeeuwse Bolus (a sweet, sugar and cinnamon, pastry typical for this part of the Netherlands) so that we would not have to eat our first oyster on an empty stomach. Because the tide does not wait, not even for oyster-hunters, the time soon came to head out towards the water. Armed with buckets, chisels, screwdrivers, wellingtons and gloves, we climbed up the dyke, where Marcel started the tour by giving us a short oyster-introduction. When he had shared his knowledge about the history of the wild oyster and provided us with some practical tips about which oysters to look for, we were all very eager to head out to the oyster-beds and begin the hunt. 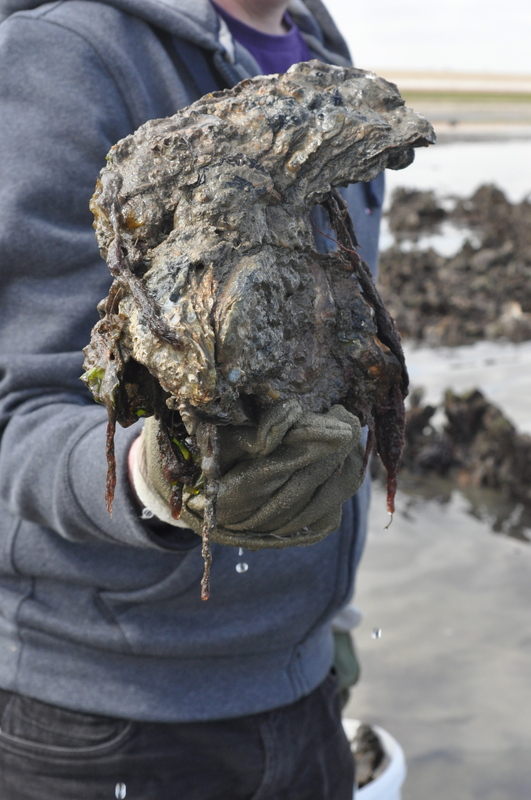 We were told to search for relatively small oysters, the size that would fit into a big hand palm. Farmed oysters are usually quite small because they are harvested for consumption after a 2-4 years. 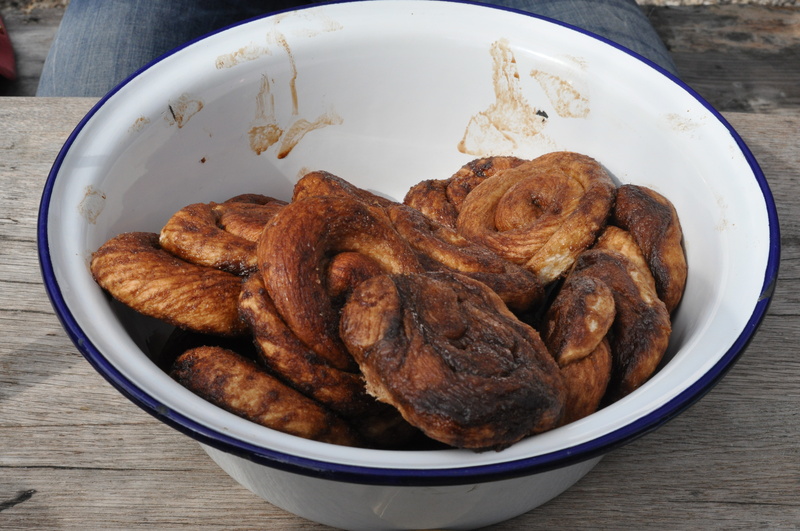 These wild oysters on the other hand can become very old (15-20 years) which results in gargantuan oysters. 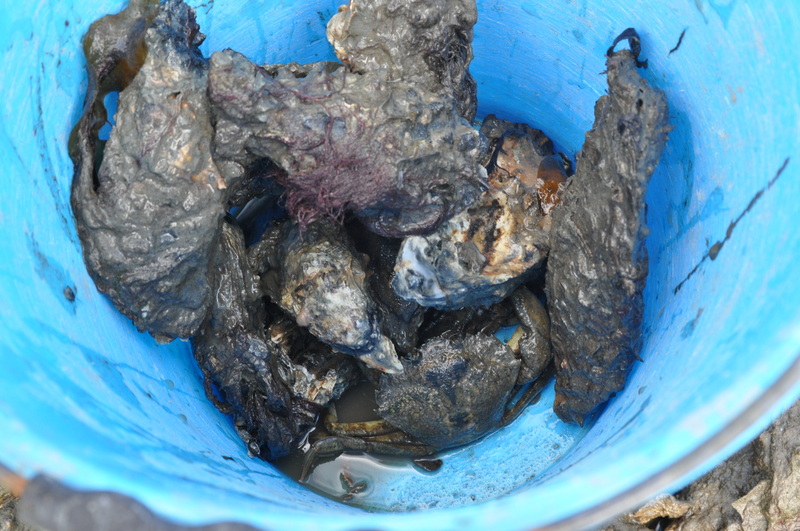 Because wild oysters have more time to grow, they can become as long as 25 cm! Besides the fact that these big oysters have too much meat in them to swallow in one go, they are also very hard to open without breaking the shell. 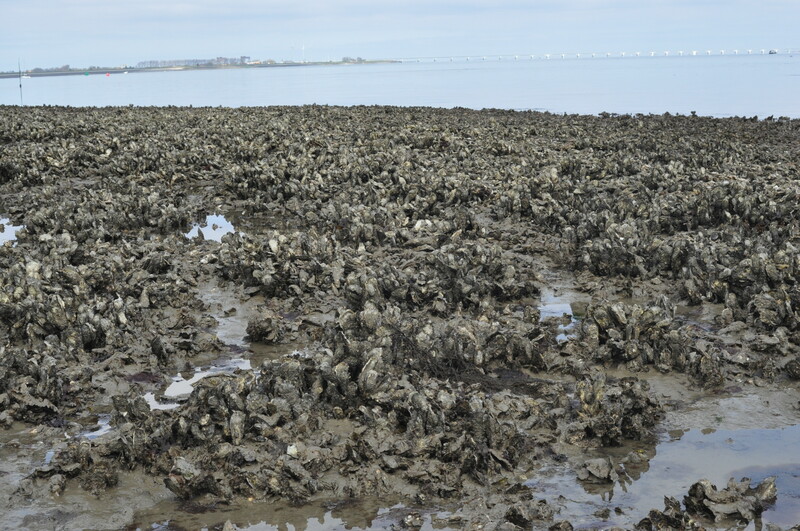 Wild oysters do not grow in neat little rows, but rather in giant clumps on top of each other. Because these oysters have razor-sharp edges, Marcel advised us to look for loose oysters and leave the big clumps alone. The reason for this is that, even with big gloves on, you could seriously injure yourself by attempting to separate one single oyster from its clump of sibblings. The foreign Japanese oyster (also known as the Creuse) was introduced to the Netherlands after an outbreak of the ‘oyster-disease’, killed most native Dutch oysters in the 1960s. 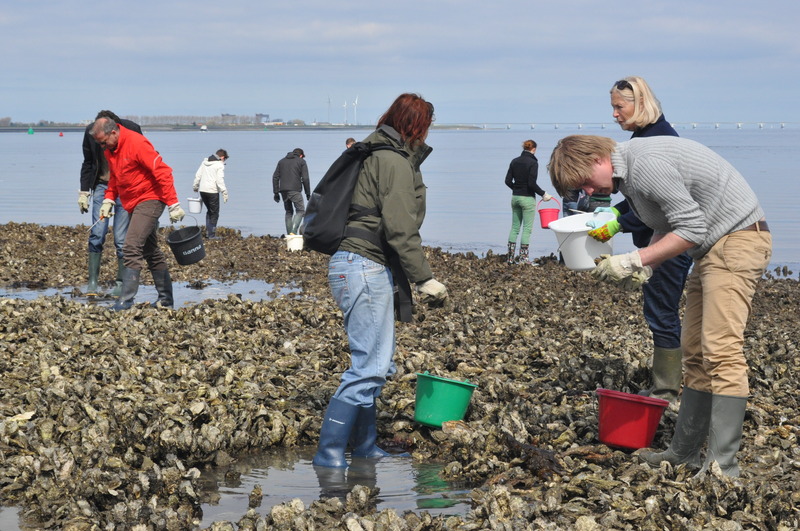 This oyster species proved to be very resilient and has flourished ever since its introduction up to the point that ecologists now even speak of an ‘oyster-plague’. Good for us! Because of the abundance of oysters in the Dutch waters, the government wants to promote their consumption and has ruled that every person is allowed to bring home up to 10 kg of wild oysters a day! 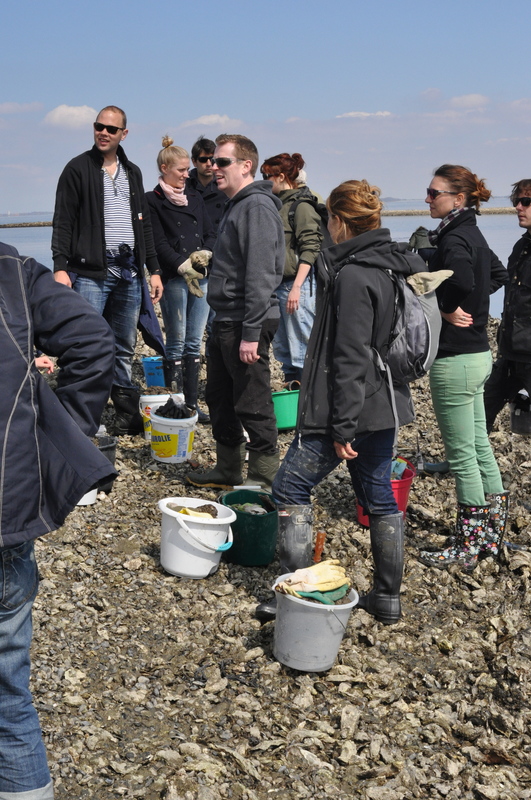 The Dutch oyster-season usually starts in September and goes on until April (all the months with the R in their names). 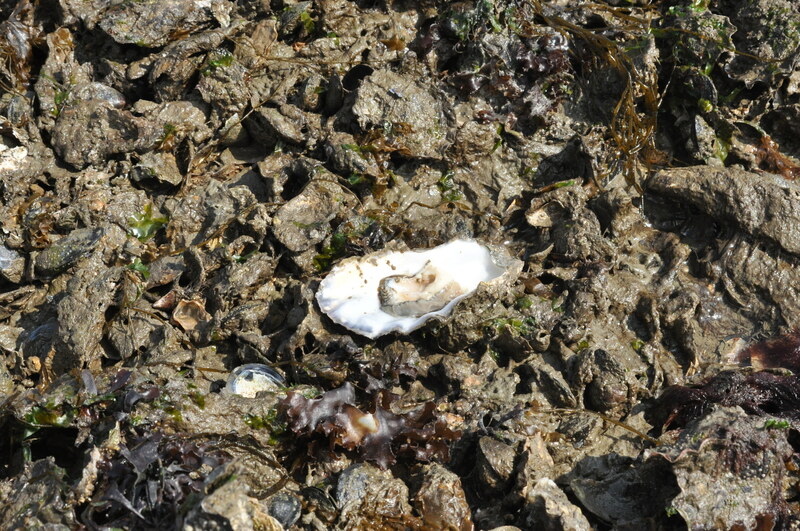 During the other months, oysters can still be eaten, but because they spawn (process where they release eggs and sperm into the water to produce offspring) during this time, they become soft, watery and less meaty. All in all enough reason to leave them alone for a couple of months if you ask me. When after an hour or so, everyone had their buckets filled up to the rim with oysters, we were ready for the next step. 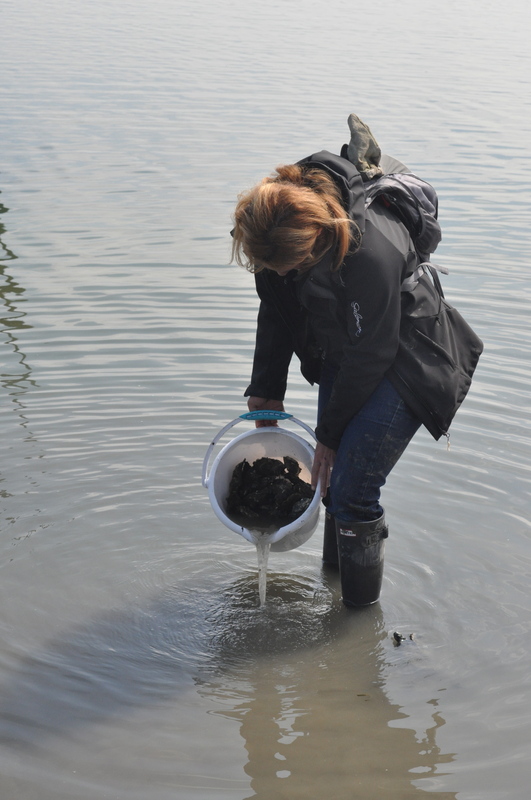 Because oysters grow in the mud we had to give them a good rinse until the water became clear instead of murky. 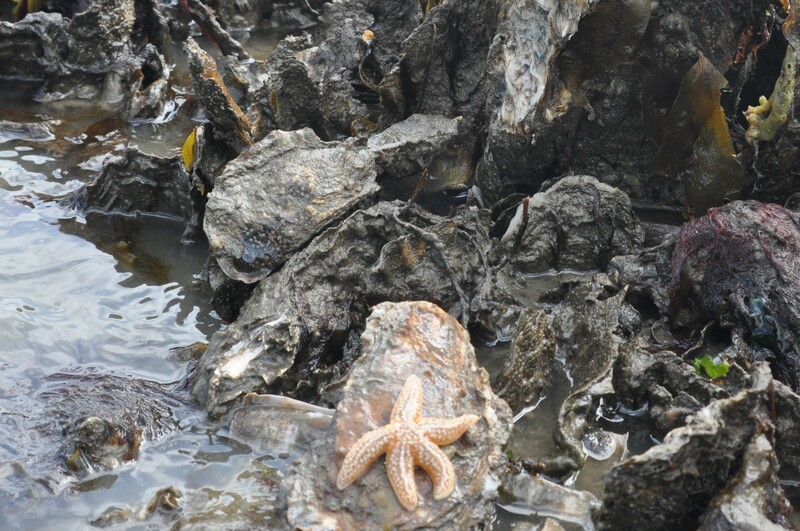 Besides oysters we also found a lot of other sea creatures, like mussels, starfish (seastars), regular crabs and even a few hermit crabs. 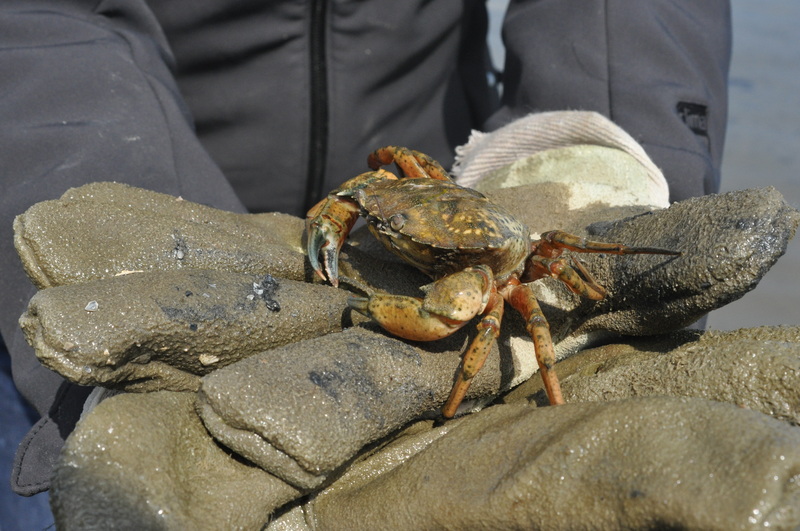 The crabs we found were unfortunately way too small to eat, so we put them back so that they would get the chance to grow a little bigger. When we were all done rinsing our oysters and had worked up an appetite, Marcel invited us all back to the cafe we met earlier that morning for the second part of the excursion: The oyster feast! If you want to know how to open an oyster and learn about different ways to eat them, please make sure to revisit my blog!